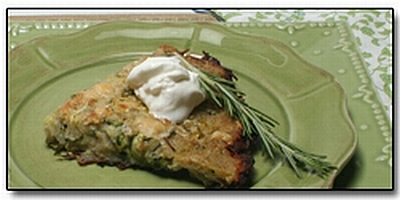 Zucchini and Potato Cakes - a great way to use up the bounty of your garden zucchini or get 'em from the Farmer's Market. This is a great twist on an old favorite! Place oven rack in center of oven, and preheat to 450 degrees F.
salt, and pepper. Mix well until all ingredients are combined. In large oven safe-skillet, heat canola oil over medium heat. These can be served warm or at room temperature.